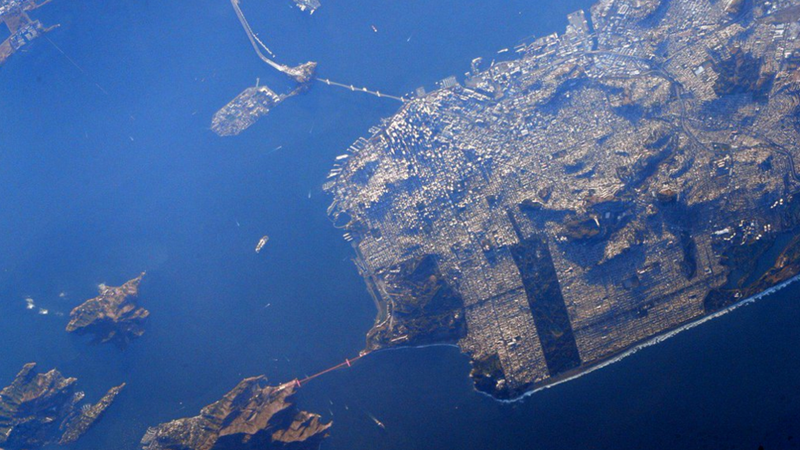 Geologists have discovered that two deadly faults beneath San Francisco—the Hayward and Rodgers Creek faults—may be linked. Should one slip, it could trigger the other fault to collapse as well, causing an earthquake even larger than the one that struck back in 1989. Geologists are very familiar with the Hayward Fault and its potential to unleash devastation along the populated subdivisions just east of San Francisco, but a new paper published in Science Advances by researchers from the US Geological Survey shows that a less-appreciated neighbor to the north, the Rodgers Creek Fault, may be connected. The discovery of a “missing link” between the two faults could change the way city officials plan for the next big earthquake in the Bay area. Scientists are quite certain that the next major earthquake to strike the region will probably result from a rupture in either the the Hayward or Rodgers Creek faults, but as the new research from USGS geologist Janet Watt and colleagues shows, these faults, which now appear to be interconnected, could rupture simultaneously. If that were to happen, it would produce a magnitude 7.4 quake along their combined 118 miles (190 km). A quake of this strength would cause extensive damage and loss of life. And at a magnitude 7.4, such a quake would be five times stronger than the 6.9 Loma Prieta quake in 1989, which led to 63 deaths and nearly $10 billion in damages. Previous work suggested that the two faults were separated by a two-mile wide buffer under the bay. The Hayward Fault stretches for 62 miles (100 km) from San Jose to San Pablo Bay, passing through Berkeley and Oakland, while the Rodgers Creek Fault runs 56 miles (90 km) north of the bay through the heart of northern California. Watt’s team used high-resolution subsurface imaging to visualize the Hayward fault as it runs under San Pablo Bay. To their surprise, they discovered a previously undetected strand of the fault that bends toward and connects with the Rodgers Creek fault. Using computer models, the researchers found that the stress patterns fit in perfectly with visual observations of fault deformation and seismic activity in the area. Because they’re interconnected, these two faults basically act as one, making it considerably easier for an earthquake rupture at either the northern or southern portions of the two faults to continue straight on through.